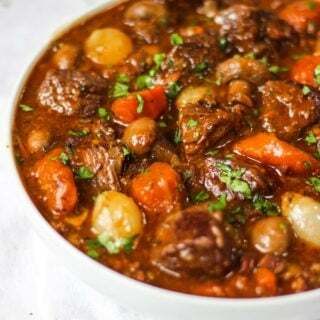 This delicious easy Beef Bourguignon recipe is simple to make in a pressure cooker, slow cooker, oven or stove top. Chopped fresh parsley to serve. Heat the oil over a medium heat in your pressure cooker and brown the beef in batches. Removing from the pan as they are coloured. After you've browned the beef and the pan is empty (apart from the beef bits stuck to the pan - keep these!) pop in the bacon pieces and fry on a high heat until starting to go brown and crispy. Add in the garlic, onions, carrots and mushrooms and fry for a couple of minutes until just starting to colour. Put the browned beef back into the pan, along with the red wine, beef stock, dried thyme, tomato puree and plenty of salt and pepper. Give everything a good stir. Lock on the lid of the pressure cooker, turn the pressure to II (or whichever regular setting your pressure cooker uses), wait for the pressure indicator to show you that it has reached pressure and then reduce the heat until it reaches a low, regular hiss. Cook for 45 minutes and when the time is up, quick release the pressure (making sure it's away from your face/hand). Spoon a ladle or two of cooking juice out of the pan into a small bowl and whisk in the cornflour to make a smooth paste with no lumps. Add back into the pressure cooker and stir well. Allow this to bubble for 5 minutes to thicken and serve.